I was for a long time searching for a real and useful project for my Arduino. I get this idea when my parents lost 2 days of work because of a power failure which disabled all fridge of their shop. After a quick look on internet I calculate that I could do a similar system for almost the same price than a commercial product. The main feature of this new project was to enable sms alert on power failure, to several predefined contacts. So there were mainly 2 challenges for me: send sms thanks to an old 3310 Nokia, and design the hardware. As you can find on google, there are many links speaking about nokia and microcontroleurs but I was not able to understand this protocol only reading blogs I found. Moreover, I couldn’t find a lib for the FBus protocol, which was Object Oriented, platform independent and working with a really small amount of ram (Arduino Uno has 2ko of SRAM). First of all, I wrote a really small arduino sketch to send fbus command to a nokia directly from the computer through the arduino UNO (which act as a simple Serial repeater): arduinoSerialTransceiver. With this, your nokia is available through the serial port of your computer, and commands can be tested directly form it (in any language). 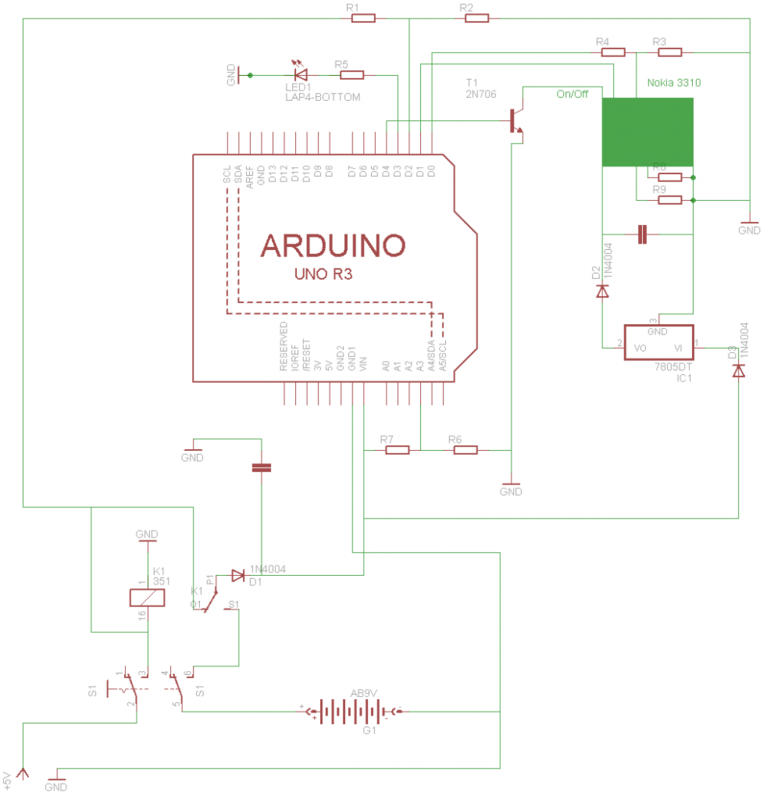 With all of this, you are now able to send an sms from your arduino. But you may want to change the Nokia initial battery to your own power supply (a 9V battery for example) so here is the power supply schema to use to start the phone: . I used a 5300µf capacitor to provide enough power to start from a 9V battery. 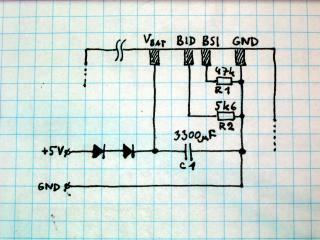 Here is the complete circuit I used to design my power supply alarm, based on an Arduino UNO. To start or stop the phone, it is just needed to simulate a on/off button push which connect it to the ground. I used a relay based power control which, with a capacitor, permit to switch to a backup power supply without resetting the board. This secondary power source is a 9V battery. If your nokia reboots at start-up, or when receiving calls or sms, it would probably be because your power supply does not provide enough current to the phone. I made tests with a rechargeable battery of 250mA but the final project has an 9v alarm dedicated battery of 1000mA. 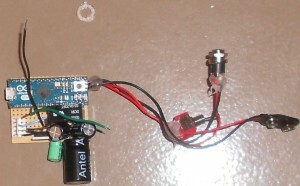 This entry was posted in Uncategorized and tagged arduino. Bookmark the permalink. Pingback: Sistema de alerta de fallo de alimentación basado en Arduino - | Noticias de seguridad informática, ¿qué es la seguridad informática? Pingback: Nokia Phone Serial Commands | wer bastelt mit?